Being a Casita owner, I am a fan of molded fiberglass rigs. I have been reading about the Nest product for a year or more. Airstreams are nice rigs as well. All of this will make for an interesting story! The Elkhart, Indiana RV Mafia can’t wait to countrify this elegant trailer. Airstream has nothing to do with Elkhart. And I am not sure “elegant” is the right word for any YETI with wheels.. Very true and tons of other RV companies as well. What is the price point for basic? NEST Caravans website, the price on a base model starts at $29,995 and goes up from there, depending on additional options. Price is to high me!!!!!! Price is to high for me!!!!!! 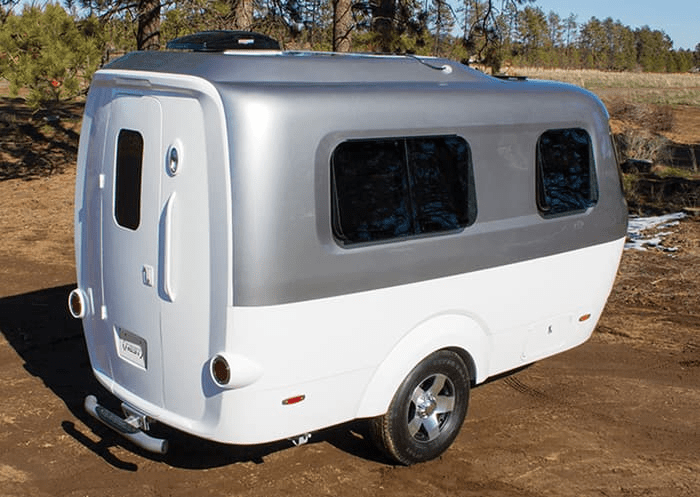 When will a smart company like Airstream make an upscale high tech small travel trailer light enough to tow with any small four cylinder car? This is very important to a downsized trending marketplace. Envision one which pops up to provide a “move around inside” area roof when camping which lowers for aerodynamic travel and better still, fits in standard at home Garage Storage, a universal residential HOA requirement! Imagine an affordable RV in every garage across America. Maybe a spin off upgrade from a “Meerkat” or “Alto” trailer. You mean like the Airstream Basecamp, that no one bought? There are companies making very nice TT’s. Heck you mentioned 2 yourself. Much as you or I might like it, the market just isn’t there. Airstream Basecamp is awesome, but it’s just a little too heavy for 4 cylinders. Wrong. There is definitely a market for an upscale small Airstream that can be towed by a 4-cylinder and lighter on the pocket book. I would love to own an Airstream but I’m not going to invest in a big block gas guzzling truck that’s heavy on the environment just to tow an Airsteam on the occasional weekend. The good news is that a couple of Airstream restorers have bought the old Silver Streak brand and designs and have started making the 1946 original design, but in various sizes, showing 13/16/22/28′ models initially. They only have a Facebook page as of now but seem to be close to production after watching the progress of their R&D. Anxiously awaiting the debut. Nice option, but to say that no other company is making a design conscious, lightweight trailers, is just untrue (look up Little Guy Worldwise, Merkat, or Safari Alto). Either the interviewer is biased, has not done her homework OR she is just trying to sell these. We have a T@B and it is lighter weight (1600 lbs), has a queen-plus bed, has a modern style, and is very high quality. Just saying… Nice new modern option through! Interesting. We are intrigued by the Nest when researching small trailers over the last few years. Will be interesting to see what Airstream does. Would be unfortunate if they take it too up market cost wise as the Nest was already kinda pricey, but a nice alternative for those of us who can’t afford an Airstream. 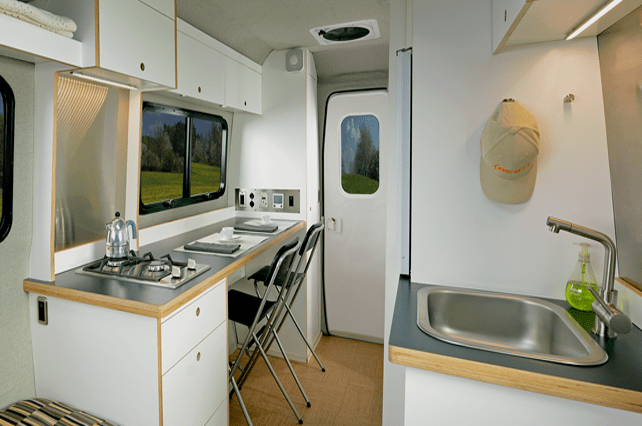 There are other mfgs making small trailers….but the Nest is so much nicer and it has a shower inside! Modern clean design..can the keep the price point at what it was or lower? Tell me how that will affect the Bambi line. Airstream has destroyed what used to be Airstream. Gone are the lightweight and easy to tow trailers, and all aircraft construction materials- the aluminum now can’t even be polished and has no aircraft aluminum quality, more like shed or gutter aluminum, and cheap. Bye bye Nest, you sold your soul to the 70 Airstream a week building Thor Industries. more information on the Nest please. UNBELIEVABLE. Nest has done nothing but make a prototype, spend thousands in advertising -marketing their concept as a finished product, and convince AIRSTREAM to acquire them. It is my hope that the Nest may serve as an upscale toy hauler for my mid-weight motorcycle. I don’t know if its rear door is wide enough in its original design by Robert Johans, by that is how I would want to use it when I am RVing. The small Livin’ Lite and Happier Camper are contenders as affordable toy haulers, but they would not provide the same level of elegant sophistication. This is a beautiful new contemporary design indeed,with the Airstream attention to detail, it’ll have a real following! I must mention though…the Lil Snoozy that we found, made in S.Carolina, is more than a contender…it’s fantastic & the first of it’s kind too! Check out the You Tube video on them! Airstream is selling the Nest for $40,000. I think that is a bit expensive when there are quality small trailers for less. Where did you come up with $40K price tag CA? The Nest Caravans website says $29K and up. 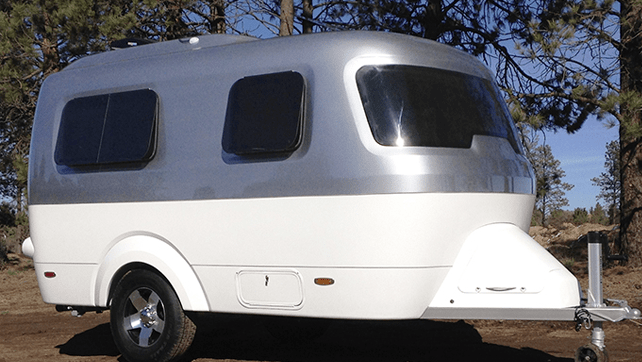 Do you really think Airstream will bump it up $10K? In Las Vegas they want $51,000+. Ridiculous! Love to get more information, when it becomes available. Love to get more information, as it becomes available. Only if u could incorporate 2 sea Kayak racks to the trailer.??? I like to know how much it cost looks very nice. If you could Email me let me know the price I would appreciate it. Put me on your mailing list I like to know the price. BEAUTIFUL camper- cant be denied. BUT, I bought a 13′ Scamp in 2010 for $12,500 with options I wanted. That’s at LEAST 1/3 the cost of this Nest or maybe more by the time Airstream gets through inflating it. While the style is there, I look at my Scamp and this Caravan and what I’m doing with it- the Caravan can do nothing more than my Scamp that I CAN pull with a Nissan 4-cyl! In my opinion, like the Airstream, this little beauty will be owned by the rich and/or famous! PS: I DO wish Scamp would innovate their style. But the demand for them in their current class is still too high. “If it’s not broke, dont fix it”. And they WONT. Don – The Nest probably won’t be out until sometime in early 2018. I’d suggest contacting Airstream directly if interested in selling them, but I’d suspect they’d want you to carry more than just those. …and, today they announced the starting price of $45900. Way to blow the price out of most people’s budget, Airstream. Can’t disagree with you. Anyone could’ve got a Nest prior to the Airstream acquisition for $15K less. I seriously doubt they put an additional $15k in value in it compared to when Nest built them either. 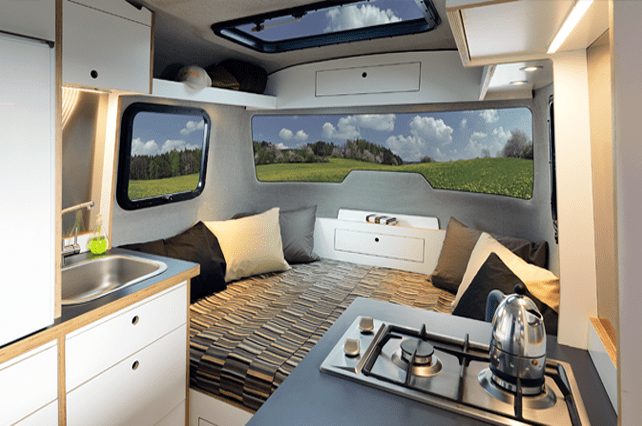 The more Airstream comes out with new products one thinks might be somewhat affordable, the more they prove they’re the “gated community” of the RV industry. Watch for the new Silver Streak Clippers built in Florida, all aircraft aluminum, built by aircraft techs and showing to be very high quality. Check their Facebook page, search on FB: Silver Streak Trailer Co. This nest is $47k looking around the internet. Well out of competitive price range. Obviously they aren’t enticing new customers and went for greed. Their choice. I don’t see $15k in additional materials either. Bye Airstream. Thanks I will. I’d much rather get the Alto Safari @ $30k (convert Cad to US) while having superior materials and craftsmanship that surpassed Airstream. Granted it’s not a Winter trailer but a solid three seasons worth of fun for sure.